Memphis is the ancient capital of the 1st <<name>> or province of Lower Egypt, Mennof-Ra, which the Greeks called Memphis and which Herodotus claim was founded be Menes who united the two parts of Egypt. Of Memphis there remains today almost nothing except a few ruins. The prophecy of Jeremiah that << Memphis shall be a waste and desolate without an inhabitant>> ( Jeremiah XLVI, 19) has been well and truly fulfilled. Nevertheless, Memphis had know centuries of great splendor culminating in the VIth dynasty when it was the principal center of the cult of Ptah. In an epigraph found at Abu Simbel Ramses II addressed the god in this manner: << At Memphis I have enlarged your house, I have built it with much work, with gold, and with precious stones … >> Not only this but Memphis was also the site of chariot factories, the main sector of the Egyptian war industry. In the center of Memphis, there must have existed the Citadel <<with the white walls>> started by Imhotep. People of every nationality, of every race and of every religion must have lived and worked in this city. It is really incredible that of all this great splendor there should be left almost nothing except an unending vista of ruins, truncated columns, walls, and bits of stone. With the rise and growth of Alexandria, Memphis was progressively abandoned and fell slowly, but inexorably, into ruins. During the course of excavations, started in the 19th century, the remains of the temple of Ptah, where the Pharaohs were crowned, and also a little chapel in honor of Ptah built by Seti I, were brought to light. 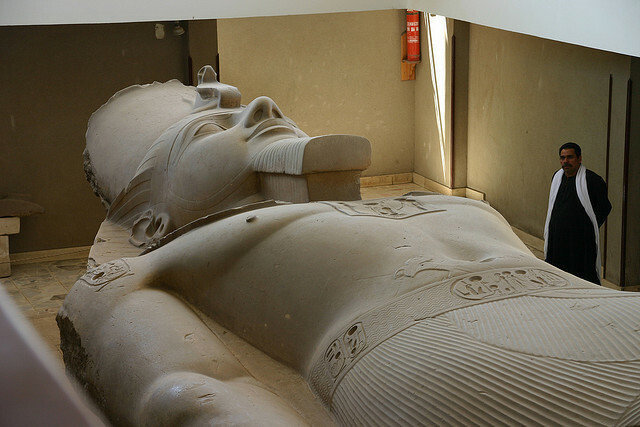 In front of the temple there once stood a series of colossal statues of Ramses II, only two of which remain today. One of those is lying in all its glory on the ground in front of the temple. Originally thirteen meters high, it bears the name of the great pharaoh engraved in his cartouche on the right shoulder, on the breast, and on the belt. A few tens of meters from this colossus one finds a Sphinx perhaps dating from the era of Amon-Ofis II. Carved from a single block of alabaster it is four and a half meters high, eight meters long and weight, it is believed, at least eighty tons and together with others it once flanked the entry to the temple of Ptah.